On Monday, November 13th, 2018 the world lost a giant in the comic and entertainment world. Stan Lee passed away at the age of 95. The world will feel the loss of this pioneering leader for years to come. I’m still trying to process what Stan Lee’s death means. He is, after all, the co-creator of Spider-Man, the Hulk, Doctor Strange, Black Panther, the X-Men, and many other Marvel superheroes. His creations have brought delight to the hearts and minds of many around the world, including mine. I still have fond memories of reading his creations. In fact, I still read many of the comic book lines he helped create. 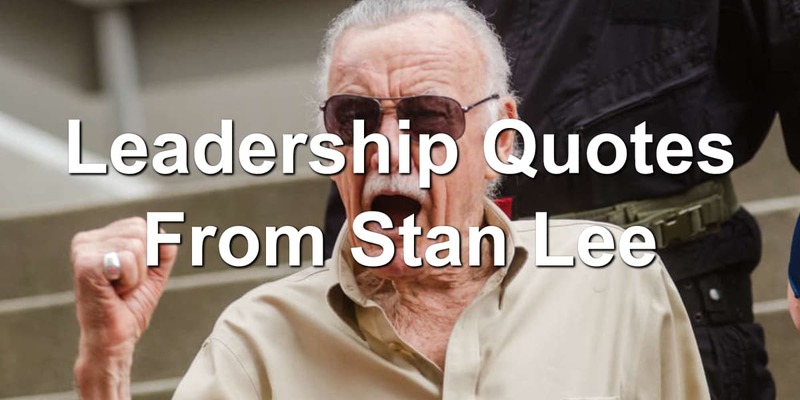 With Stan Lee’s passing, I wanted to take a look at some of the memorable leadership quotes of Stan Lee. I hope you’ll join me in paying tribute to the life of Stan Lee and the joy he’s brought to so many people. 1. If I’m half as good as everybody said I am, I’m far too good to be wasting time with ordinary people. But I seem to be spending my life with ordinary people, who are the best people in the world. Lots of people told Stan Lee he was too good to spend time with the average person. What Stan Lee found out was the average person is pretty amazing. They may be the best people in the world. Don’t let an inflated ego get to you. Know you need to spend time with other people, both leaders and followers. These people will enrich your life. 2. With great power comes great responsibility. The line that made Spider-Man. Without Stan Lee writing this line for Uncle Ben, Peter Parker may have never taken up the mantle and fought the good fight. The power you’ve been given as a leader comes with a great responsibility. Don’t abuse the power you’ve been given. 3. To have an idea is the easiest thing in the world. Everybody has ideas. But you have to take that idea and make it into something people will respond to — that’s hard. You may have a great vision for your organization. But can you get people to respond to the vision? That’s hard. You need to learn to excite people and get them to buy into the vision. When you do that, you’ve done something great. 4. All of the characters at Marvel were my ideas, but the ideas meant nothing unless I had somebody who could illustrate it. While there is some debate over how much Stan Lee contributed to the creation of many Marvel characters, this quote stands true. You can have great ideas. You can have the best ideas in the world. Yet if you don’t have people who can help you bring those ideas to life, they’re nothing. Find people who can help you bring the vision to life. 5. I used to be embarrassed because I was just a comic book writer while other people were building bridges or going on to medical careers. And then I began to realize: Entertainment is one of the most important things in people’s lives. Without it, they might go off the deep end. There’s a big push for those looking to grow to rid themselves of entertainment. To forgo TV, the movie theater, or fiction books. This is a big mistake. Stan Lee realized his work means something. People need to be entertained once in a while. You can’t live a good life without a little bit of fun. Don’t be ashamed of enjoying entertainment (or of making entertaining items). People need entertainment in their lives. 6. Just because you have superpowers, that doesn’t mean your love life would be perfect. I don’t think superpowers automatically means there won’t be any personality problems, family problems or even money problems. I just tried to write characters who are human beings who also have superpowers. What superpower in your work are you looking for? Do you think gaining a specific skill or talent will make everything better? The truth is, you’ll still struggle. Regardless of whether or not you know everything, are able to do everything, or lead the best… Life will still hand you troubles. 7. The experience of reading a printed comic book will never change, but now, thanks to the digital age, there are many different ways to enjoy the same story. Digital comic books, of course, can be interactive in many different ways, allowing the reader to feel like a participant in the story. Truth: I hate digital comics. Sure, they don’t take up a lot of space or get damaged. But there’s something missing to me. This doesn’t make digital comic books bad. There are millions of people who enjoy digital comic book reading. I’m not one of them. Still, I can see the benefit of them. They provide an easy way to get comic books into the hands of fans. They won’t break or get damaged. And you don’t have to store them in a physical space. What technology are you avoiding because it’s different? Stop being scared of the next new thing and embrace the technology that could revolutionize your business or organization. 8. I try not to do anything that’s too close to what I’ve done before. And the nice thing is we have a big universe here. It’s filled with new ideas. All you have to do is grab them. We can have a tendency to look back at what we’ve done and long for those days. We pine over the success. All the while, we forget what’s in front of us. There’s a whole world of possibilities for you to go after. Be wary of doing the same thing over and over again. Go out there, grab a new idea, and implement it. 9. Luck’s a revolving door, you just need to know when it’s your time to walk through. Don’t look at this luck as the traditional definition of luck. Instead, see luck as being prepared and knowing when to walk through the door luck, timing, and preparation has opened. 10. If Shakespeare and Michelangelo were alive today, and if they decided to collaborate on a comic, Shakespeare would write the script and Michelangelo would draw it. How could anybody say that this wouldn’t be as worthwhile an artform as anything on earth? People are quick to judge something they don’t deem worthy enough. Often, this happens with forms of entertainment. As a reader of this blog, you know entertainment can teach, entertain, and make our lives better. Don’t let anyone tell you otherwise. 11. Reading is very good. And you can quote me! I don’t think any of you will have a problem believing this is a great Stan Lee leadership quote. Reading will help grow your mind. Be an avid reader. Never lose your love of learning. 12. Another definition of a hero is someone who is concerned about other people’s well-being and will go out of his or her way to help them — even if there is no chance of a reward. That person who helps others simply because it should or must be done, and because it is the right thing to do, is indeed without a doubt, a real superhero. I think this definition of a hero could be applied to leaders as well. Leaders are people who are concerned about growing other people into the leaders they’re destined to be. They do this because they care about people. Leading can make you a superhero. 13. I never thought that Spider-Man would become the worldwide icon that he is. I just hoped the books would sell and I’d keep my job. There are times when you feel stuck. Stan Lee felt this way and created Spider-Man to sell books, not become famous. He was just doing his job and wanted to keep it. Have you ever been there? You want to just tread water until things are good again. There might be nothing wrong with this. After all, Stan Lee treading water led to the creation of Spider-Man. 14. Do unto others as you’d have them do unto you” is the greatest phrase ever written. If everyone followed that creed, this world would be a paradise. I love this Stan Lee quote. It sums up what all of us should be doing. We should do unto others as we would have them do unto us. This means treating them fairly and with value. You treat people kindly. You show them you appreciate them. 15. I don’t really see a need to retire as long as I am having fun. Stan Lee worked for most of his life. I don’t believe he ever really retired. I know he was going to comic conventions up until the very end. If you love your work, you don’t have to retire. You can keep leading others and showing them the way. Rest in peace Stan. You worked long and hard. Thank you for all the joy you’ve brought. Question: Do you have a favorite Stan Lee quote? Share it in the comment section below.